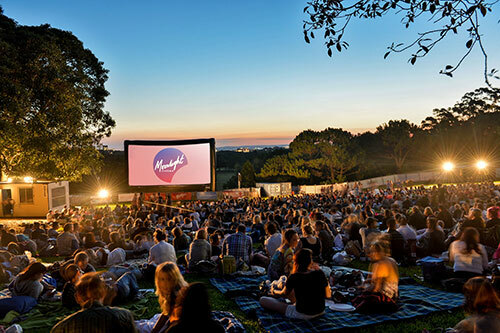 I’ve experienced watching movies at Moonlight Cinema Sydney Centennial Park several times, these are my top tips to enjoy the evening. Sydney’s Moonlight Cinema is located at Belvedere Amphitheatre, Centennial Park (on the corner of Carrington Dr and Broome Ave) Paddington. The nearest gates to the cinema are the Woollahra Gates on Oxford Street. Limited parking is available, if you arrive early. Many buses from the Sydney CBD, Central Station and the Eastern Suburbs stop near Centennial Park. There aren’t any train stations conveniently nearby if you’re carrying lots of picnic gear, Bondi Junction train station is a 20 minute walk away. If you’re catching a Taxi/Uber there book a trip in the app to Broome St, Centennial park. Note that after the film ends you need to exit from the Woollahra Gates and there’s usually fierce competition for flagging taxis so pack up your stuff after the movie and leave quickly. Bean bags are available for hire at the venue. However you’re welcome to bring your own beanbags, pillows and/or picnic blankets, plastic backed ones are better in case the ground is damp. Some people bring their own deck chairs. Insect repellent is a must have in case mosquitoes are about, as well as warm blankets to snuggle in with your loved ones. It is wise to bring a jumper (I prefer a Uniqlo puffy duck feather jacket) as sometimes Sydney summer nights can get cold after the sun sets, especially if a strong southerly wind arrives. The Moonlight Cinema program includes a mixture of new release, recent release and classic films that run from December to March. If you’re going to have a picnic dinner then you should arrive early to enjoy the atmosphere, Gates open an hour and a half before the film starts. I suggest trying to sit closer to the screen as the audio isn’t as clear to hear towards the back. The atmosphere is relaxed as you chat with friends and family while bats fly overhead in Centennial Park heading home to roost through the warm humid summer air. You can hear them chirping through the evening as they settle down to sleep in nearby trees. Movies begin at approximately sunset, ours was advertised for 830pm. Ads started at 840pm and the film started at 9pm. If we hadn’t arrived at 730pm we wouldn’t have got a good picnic blanket location. If you’ve got a premium ticket with beanbags included these are in better viewing spots than the picnic blanket area and you don’t need to arrive as early. You’re welcome to buy food and drink at the venue or bring your own food and drinks including alcohol. Don’t worry if you plan to have a drink or two during the movie, there are good bathroom facilities at the back of the cinema grassed area. Unlike a movie theatre you’re welcome to bring Fido or Fifi along with you to Moonlight Cinema in Sydney, Melbourne, Brisbane and Adelaide. Just make sure to keep them on a short leash in case they get excited and decide to try and go for a run to greet nearby dogs. I suggest trying to sit closer to the screen as the audio isn’t as clear to hear towards the back.